Sometimes it happens that the power of the regular TV speakers are not enough to fully convey the quality of sound effects watch the video. After all, the televisions put budget speakers to not increase the price of the TV, if only it was enough to see the television broadcast. But what to do if you want to fully enjoy the sound effects of the new film? It remains to find a way to connect additional speakers. Additional speakers, adapters, adapters, wires, amplifier, receiver, hi-Fi. As a rule, a sound processor the TV handles the sound well enough, spoil the whole picture just the regular TV speakers. But not to change them for others? 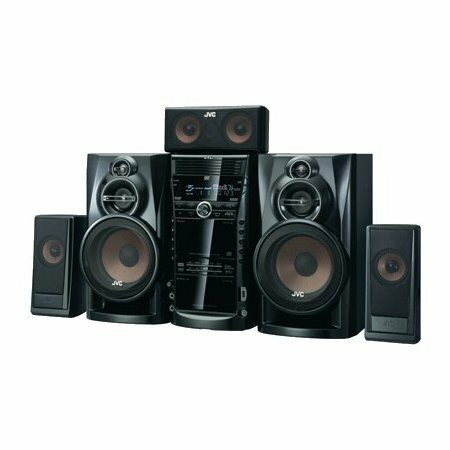 Bring speakers from your computer. They have a 3.5 mm Jack, headphone icon next to it, but the better sound quality you are unlikely to achieve, if your computer speakers has a built-in amplifier. 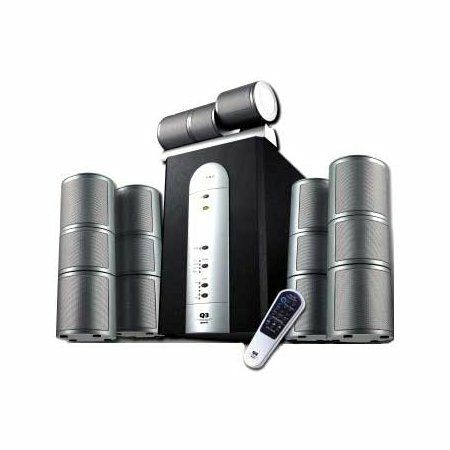 If additional columns are included in the network 220 volts, the amplifier a hundred percent there, and the sound level can be adjusted on the speakers themselves. 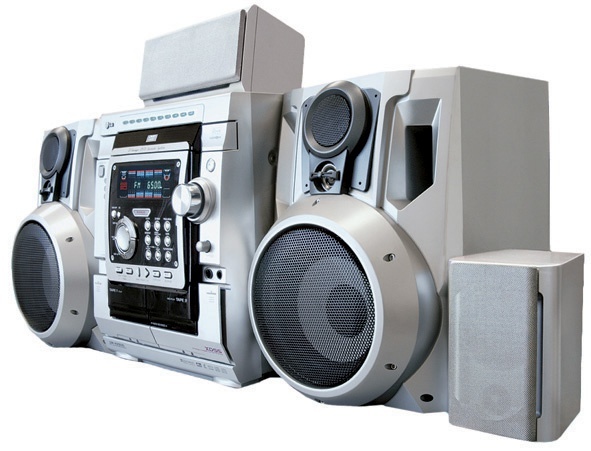 Speakers can be connected via a tape recorder or musical center. Music center or VCR connect to the TV to reproduce the sound he knows how much higher budget TV or computer speakers. The connection is done by wire TRS-RCA or RCA-RCA. TRS is a 3.5 mm Jack and RCA – in the common bells. Locate the corresponding jacks on the TV and music centre, and connect them to the corresponding wire. If you have a standalone stereo system, you just lucky enough, the amplifier of this system is specially configured to work with powerful speakers, the sound system will be almost the Acme of perfection. This system contains an Autonomous quality amplifier, built in subwoofer, it puts the sound on the speaker system, depending on how many of them (columns can be from 3 to 7). Similarly, she connects the music center, but may also have an additional SCART – wide connector with two rows of contacts inside. If your TV only has SCART, use the SCART adapter - SCART or RCA - TRS. 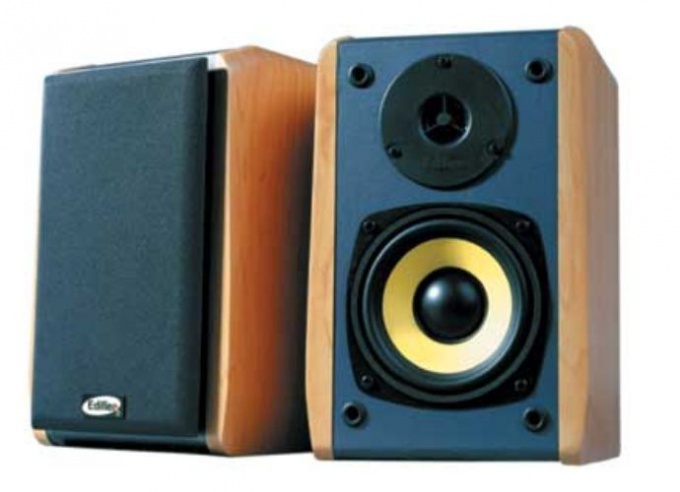 Top sound quality can serve as composite stereo, you can connect speakers of any capacity. This is a professional amplifier and receiver. It connects any of the following methods, that provides wide opportunities for its application. Do not connect too powerful speakers to outputs on the TV without an amplifier, this can burn the sound chip, and then the film will have to watch without sound. Each connector has its own signature and icon kruglyashek with an arrow means that the out connector of the output channel, and if the arrow inside roundels from the input. Connecting speakers to a TV, gives the opportunity not only to increase the quality of the audio signal, but also provides additional opportunities for control and sound quality settings on individual parameters. Connect the speakers to the TV to control the sound quality depends on the combination of audio output and TV input to the speaker. If there is a mismatch in the acoustic parameters of the system, you must use the receiver. Different speakers use different audio inputs, so you need to determine the connected cable. To output the audio sound from the speakers, apply the function "AUX". To connect speaker via cable "2 RCA audio", which uses the "Euro" standard, as in the TV and sound system. Cable with the audio output of the TV connected to the audio input of the speaker system. Some TVs and audio systems is using the "SCART". For this connection, required cable length SCART to SCART". If the TV uses a "SCART", and the speaker system audio input "2 RCA audio, connecting speakers, you must purchase a cable "SCART to RCA". In acoustics using input "Jack of 3.5 mm and TV exit to 2 RCA audio". In this case, a cable Jack 3,5 mm-RCA to connect speakers. If the TV uses the output "SCART", and in the acoustic input", 2 RCA audio, then use a cable "SCART-3.5 Jk+Ph 3m. For TVs with a mono output signal, it is better to connect the audio system using the DVD player or stereo VCR. To use any cable to connect. To get better quality or have a problem with soedinenii TV and sound system, you must use a receiver. To get the maximum effect of the movie is not only the image must be high quality, but the sound. That's why the last time speakers for TV has become so popular. In modern stores you will find plenty of options, so you will have plenty to choose from. In everyday life has firmly entered plasma TVs and LCD TVs, modern audiences need good acoustics, a realistic "picture". Purchase small TV for bedroom or kitchen, and powerful setup that includes all possible know-how - the process responsible. Because the modern customer wants the best and wide range allows him to claim it's the best at the best price. If you wish to connect musical center to a computerhave, you will only need a special wire adapter and some free time. Planning to connect musical center to a personal computer, you have to get a special cord adapter that will allow you to synchronize the devices. You may need two types of leads: with split plug on both ends (current when connecting the music center to your PC via a subwoofer), and the wire with split plug on one end (required for direct connect center to the computer). As you know, there are two ways to connect music center to a PC, which we will discuss in more detail. Connecting the music center to a PC via the subwoofer. If you notice on the back panel of your entertainment center, you will see two nests close to each other (audio). One bifurcated end of the wire insert in these nests, while the other forked end must be inserted into the subwoofer (instead of speakers). Turn on stereo and set it to playback mode "AUX". Connect musical center to a computer directly. In this case, you will need a wire, one end of which is equipped with a split plug, and the other one. Insert the forked plug to socket music center. A solid plug should be inserted into the audio output on the rear panel of the computer. In the dialog box, specify the device as the "center channel/subwoofer". After connecting, turn on the stereo and set the mode to "AUX". So you follow the correct connection of the centre to a PC. Sound system connected to TV, is designed to perform one function - to improve the sound quality on the sound track of the film being viewed. Must be able to adjust sound quality to suit individual desires. 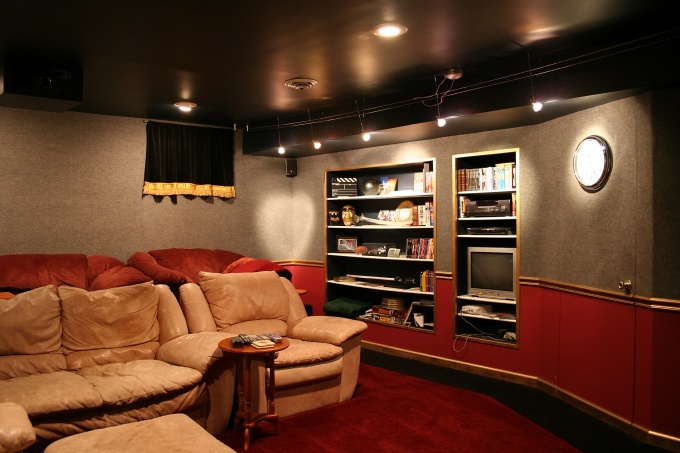 To connect the acoustic system to the TV in several ways: If the TV output a mono signal you can connect to TV, DVD, And the DVD output on the speakers. Such a connection is possible if your TV has "audio out", and the DVD "input". If the TV has a built-in "headphone output", the audio speaker system can be connected to this connector. In this case, you must buy an adapter "headphones" - "tulips". The most ideal option is to connect the speaker system to the TV is using the receiver. 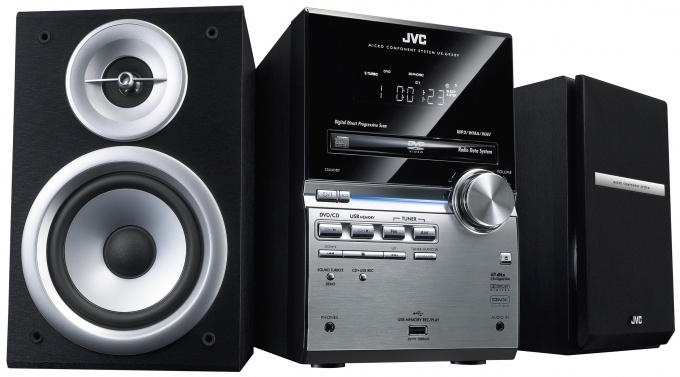 In this connection, first, the sound quality is much better than the above options, and secondly, there is no difficulty in connecting the TV and sound system. Thirdly, when using a receiver there is no need to think about the discrepancy between the acoustic parameters of the system. - if the TV out "SCART", and the acoustic system system input "to 2 RCA audio". In this case, the required cable type "SCART-to-3.5 Jk+Ph 3m. Connecting the music center to the TV, you will achieve not only increase volume but also improve its quality in General. To connect, you'll need to spend a couple of minutes of your time for appropriate action. Music center, TV, transitional cord. Fun devices. Inspect the TV and music centre, you'll notice them on a pair of identical connectors. Data connectors will be identical not only by type but also by their colors. More specifically, these connectors are provided for receiving and transmitting sound to other devices. They and you need. Before you begin to connect musical center to a TV, you need to visit the specialized store, where you must purchase "pair wire for audio" (this wire is called, explain to the seller what it is for and will provide you with the right product). Once the appropriate wire is purchased, you need to perform the following steps. Insert one end of the wires (two plugs) red and white connector on the TV. The other end into the red and white connector on the music centreE. Turn on the music centre and TV. The sound does not play? Right now you do not hear. To start audio from the TV to the music center, you need to switch the center to the playback mode to "AUX". 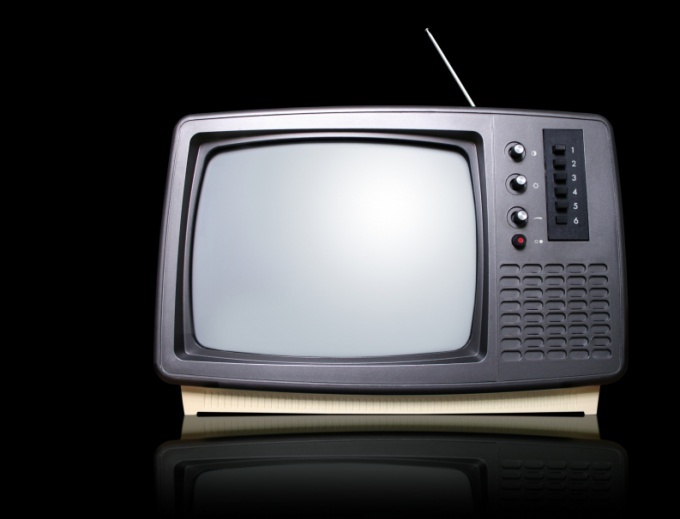 Once you do, you will immediately hear from the speakers the sound signal broadcasted from the TV. Contemporary music centres with high-quality acoustics. Instead of buying expensive speakers for a computer, it is possible to connect the centre via the standard line out on your sound card. This will help to get a good sound with minimal equipment. First, make sure that the music has an AUX. To do this, locate among the available modes on the remote control corresponding button, or view whether the center of the two jacks of different colors on the back panel(usually yellow and red). Go to the electronics store or radio shack and get the appropriate cable. You can buy a 3.5 mm extension cord. Connect the cable to the computer via the line out (usually the center hole of the green color on your sound card). The other two insert the plug into the hole for the AUX. Turn on the center and select the AUX mode, make all the relevant sound settings. In the dialog box, the sound card driver identify the device as a "Speaker" or "Subwoofer". Test the sound. If there is no sound, run the utility to control the sound driver (its name depends on the model of the sound card). Independently verify the required settings and try to reconnect the cable, check the connections. 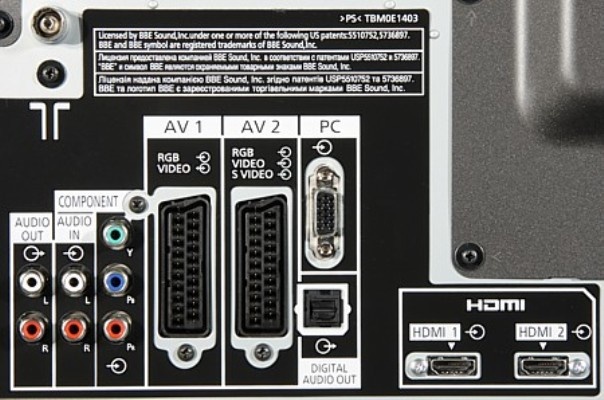 If the music centre has the function of video playback, the kit should be a cord that connects to the graphics card via S-Video output. For best quality use an S-Video cable-2RCA. If the plug is not suitable, then to connect, you can use an adapter to RCA which comes with any graphics card. After installing it you can use a cord RCA-2RCA. Try not to use adaptors for the cords. The more adapters the more the likelihood of a "bad" contacts. It is also possible to connect the music center through the subwoofer. For this you need to purchase a wire with two bifurcated ends, one of which is inserted instead of speakers in the audio device. The other end should be connected to the music center. The speakers built into the TV, often have mediocre sound quality. To improve it by connecting external speakers. They can be attached in two ways: through an amplifier or directly. In order to use the first method, you'll need the skills of maintenance of TVs and perfect knowledge of the safety rules. Turn off the TV, open it (do not expose it to shock, not to break the picture tube or LCD panel), and then, without touching the picture tube, high voltage wire, as well as parts of the power supply, video amplifier, power Converter backlight (LCD TV), line scan (a tube in the TV - and any other parts), desolder the wires to the speaker, splice them long cable, and then output outside of the TV so that they do not pass near any high voltage circuits. Have a stereo TV output cables from both channels. Then close the housing unit. If you are not confident, commit the operation by a qualified technician. 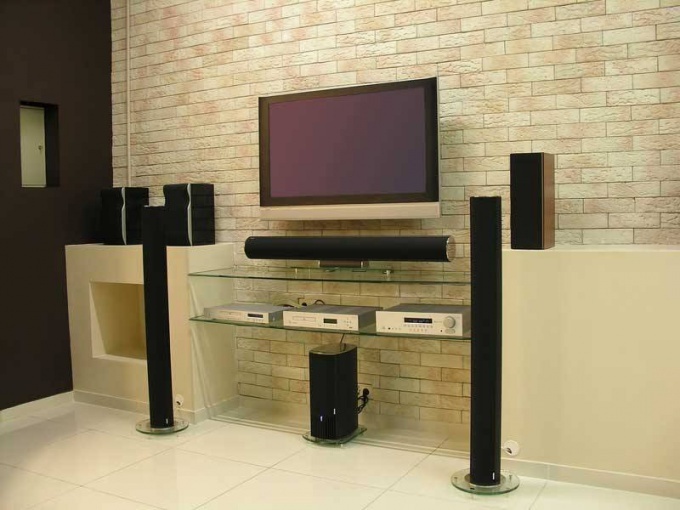 Take a speaker system with a resistance similar to the same parameter built-in speaker of the TV or stronger than him. Connect the cable you output to this speaker system. If the resistance of one system is lower than the loudspeaker of the TV, but you have two of them and their total resistance exceeds this figure, connect them in series. If the TV is stereo, connect the acoustic system instead of each of the built-in speakers. The second method does not require considerable skill, but involves the use of an external amplifier and requires the TV line-out sound. Output signal clear with RCA connector Audio out (building - ground, center pin - output of sound), with DIN-connector "VCR" (the middle contact is common, and output, depending on the model year of the TV, can serve as either the rightmost or the leftmost pin) or SCART connector (pin 3 - output, 4 - common). The signal feed to the input of the amplifier, where it can be used connector to RCA or DIN. Way to connect to those connectors described above. The stereo amplifier features either two RCA jacks, either a single DIN, which is input to the right channel uses one of the extreme contacts (which depends on the year of its release), and for left - contact between the contacts of the right channel and common wires. If the TV is mono, and the amplifier - stereo inputs (but not outputs!) amplifier connect together. Turn on the TV and in the presence of amp. In the second case, initially set the amplifier to minimal volume. Then adjust it to the desired level. Do not perform the above-described manipulation with auto transformer and transformerless TVs. Quality sound built-in speakers of the TV is not always high. But even a compact apparatus can be made to sound much better. It is enough to connect it to an external amplifier with speakers. - power sockets SCART.If there is at least any one of the above, connect the TV to the amp . The socket type DIN as the common wire use the middle pin as a contact, on which there is a sound signal to either the left or right, depending on the date of issue of TV. Stereo TVs have a nest almost never occurs. If it is, then extreme right or left contact to the right channel, and one that is between him and the General left. Into the headphone Jack connect the cable with the plug, taken from the ruined headphones. Two white or yellow conductor with the common wire, green or blue is left channel, red, or orange - to the right. Have a mono TV outputs channels are connected in parallel. Note that the sound volume in this case will be possible to regulate not only the amplifier but also on the TV. Connector type RCA as a General use contact ring, as the output - pin. If the TV is stereo, the nest corresponding to the left channel - white (like a mono TV), right red (and sometimes Vice versa). Do not attempt to remove the sound signal from the yellow connector - there is present only the image signal. On the standard SCART socket contact 4 use as a common contact 3 remove the signal of the left channel, pin 1 - right. Have a mono TV pin 1 do not use. The method of delivery of signals to the amplifier depends on what it uses input sockets (DIN or RCA). The signals they serve as described, respectively, in steps 1 and 3. If the TV is mono, and the amplifier - stereo, latest inputs connect in parallel. If the signal is removed from the headphone output, use the input of the amplifier with the worst sensitivity. Before connecting unplug the TV and the amplifier. If the sound output from the TV, remove the signal from the corresponding output of the VCR or DVD player.